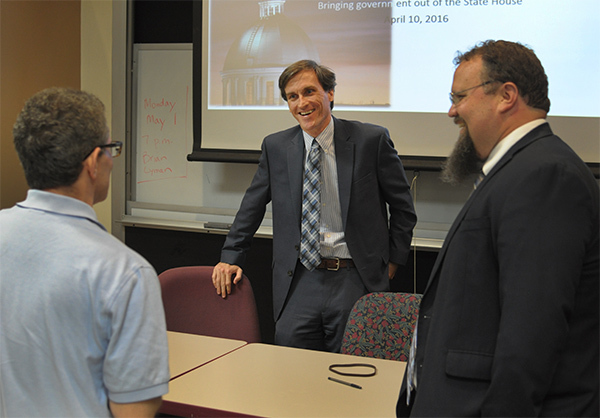 Alabama politics was just calm enough May 1 to allow veteran government reporter Brian Lyman to present the 2017 Timothy Sumner Robinson Forum at Samford University. The forum—a lecture series created in honor of the distinguished Samford journalism and mass communication alumnus Timothy Sumner Robinson—brings to Samford leading voices in journalism. Lyman certainly fits that description. Currently with The Montgomery Advertiser, Lyman has reported for almost a decade and was named one of the best statehouse reporters in the United States by The Washington Post in 2014. Lyman told his audience of Samford journalism students that he recalled his intimidation, early in his career, on hearing a speech by the journalist Ken Tomlinson, who described a profession of constant work, confrontation and struggle. “It was journalism as Game of Thrones,” Lyman said. “Reporting today is probably better than it was 50 years ago,” Lyman said. Short, context-free stories and irresponsible coverage were common then, and it took innovation of the sort led by the New York Tribune to create better journalism. Reporters like the Tribune’s Jimmy Breslin found new and enduring ways to tell the human stories behind major news events. “Whatever challenges we face, whatever technologies sink into oblivion or emerge over the horizon, journalists must always be storytellers,” Lyman said. “You can and must verify the data you have, but to properly do your job, you must show how that truth affects the way we live, love, labor or learn. You must show an individual living with that fact for good or ill.” Lyman reviewed two of his own stories, about proposed Medicaid cuts and Alabama’s troubled prison system, to illustrate his point. Although Lyman said it hurts to see talented colleagues lose their jobs in the downsizing trend, he finds the current environment for reporting the most exciting of his career. “We have new ways of knowing how readers are responding to our stories, new technologies to present those stories and, from my standpoint, a new freedom for reporters to tell those stories,” he said. “These will connect people to government and government to people,” he said. “They will allow an unheard voice to ring out in the statehouse. They will lift a curtain on what needs to be seen. They will advance, or in some cases begin, debates that must occur.